Missed the September 2017 edition of WIT eNews? View all the details here! Join us for a night of food, fun and networking with Stephanie Espy – author of “STEM Gems,” Chemical Engineer, Founder of MathSP, and mom. If you are new to WIT, come introduce yourself and bring plenty of business cards. THANK YOU TO OUR FORUM SPONSORS! Join US AT WIT AWARDS 2017! 2017 WIT Awards Honorees have been announced! As the Business Agility movement gains momentum at the corporate level and helps transform the way we work, sharing experiences accelerates that movement. During this session, you will gain insight into a cultural transformation journey which highlights: the need for change, the challenges faced, the approaches adopted, the lessons learned, and the benefits harvested. Join WIT for networking, a keynote by Nanci Taylor, and an Agile Panel Discussion. Wine, drinks, and hors d’oeuvres will be served. Click here to learn more and register for this event! Join WIT at the inaugural Leadercast Women event on October 5, 2017 to hear from top female leaders like Laura Vanderkam & Dr. Neeta Bhushan on honing your purpose, leveraging your value, and maximizing your skills in the workplace and beyond. You’ll discover strategies and relevant takeaways that will help you become a Leader Worth Following. As an event sponsor, WIT community members have access to discounted tickets using promo code ‘WITATL’ at checkout. Limited discount tickets available. Promo code applicable while supplies last. Join WIT and the Canadian consulate for the Women in Business North America Summit on October 3-4 at the Georgian Terrace. Over a two-day period, women entrepreneurs and business leaders will participate in workshops that discuss some important, but often “missed” strategies and solutions critical to business and career growth. The conference will offer opportunities to meet one-on-one with procurement executives, participate in mentoring sessions, and create relationships with other North American-based entrepreneurs and business leaders. 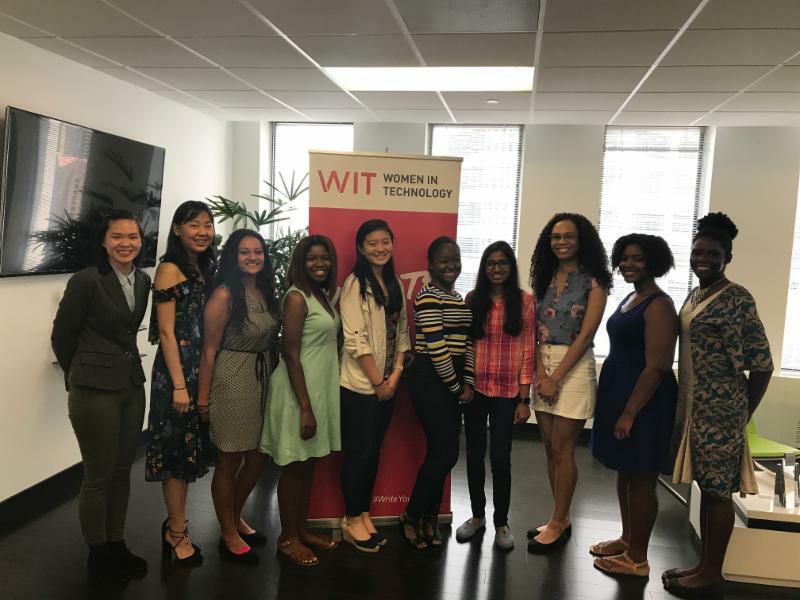 This summer marked the inaugural year of the Women In Technology (WIT) Internship Program. The program was made possible by a grant from NCR Foundation to support WIT Girls and WIT Campus programs in underserved areas of metro Atlanta. The internships exposed the students to real-life application of careers leveraging STEAM degrees. Join WIT for a panel discussion with inspiring female IT professionals and a tour of the Fiserv facilities, at the Tech Heroes event. This event is designed for middle and high school girls to gain insight into: what the technology profession is all about and what it is like to work at a Fortune 500 company – including a tour of the Fiserv campus, influential women in technology – how they got to where they are and how they achieved their significant accomplishments, and next steps in education and how to approach a career in STEAM. Click here to learn more and register for this event! Join WIT Campus for their kickoff event at Atlanta Tech Village. This event, sponsored by Microsoft, will assist students in building their professional brands while leveraging Microsoft technologies. Students are required to bring their electronic devices to this event. Registration is limited – only 75 spots available. Click here to learn more and register for this event! Join WIT Campus for a panel discussion comprised of the women of Fiserv where they will share stories of their experiences in the workforce as IT professionals. This event is open to Georgia State students only. Click here to register to attend this event. WIT Executive Director, Sandy Welfare, shares her thoughts on the recent Google memo. Click here to read more. Listen to the latest segment of Business Radio X’s Women in Tech/STEAM Series featuring Kara Brown, Founder and CEO of SmithBrown Marketing here. Jennifer Pearson is a Kennesaw State University graduate with a BS in Cultural Diversity Studies. Jennifer has extensive experience working with a number of start-up companies in the social media strategy space including Hypepotamus, iFusionMarketing and UDebate. Jennifer now serves as our Officer Coordinator with a focus on managing WIT Systems and will work closely with Sandy and Pat on a number of WIT programs/initiatives such as WIT Forums/Socials (Denise Smith), WIT Careers (Melissa Phillips), WIT Awards (Samantha Oltean), Marketing/Communications (Kara Brown and Shauntel Hall, SmithBrown Marketing), Event Planners (Candice Crossfield and Rebecca Godleski, Concerto Conference & Events). Karen Garcia is a recent Georgia State University grad with a MS in Astronomy. Karen comes to WIT with class room management skills and experience organizing and planning for outreach events and research sessions. Karen serves as our new Volunteer Manager.In this role she will be responsible for recruiting, conducting volunteer orientations and managing all volunteer activities. Karen will also manage small program events such as WIT Girls, NCR Initiative and WIT Campus. In this role she will work closely with Carrisa, Dr. Andrea and Natalie. ChiChi Okafor is a Consultant at Systems Evolution, Inc., with over 16 years of experience with various roles spanning consulting, program/project management, IT and marketing. She has worked with various Fortune 500 companies like Delta Air Lines, Merrill Lynch, Pfizer Pharmaceuticals, and Pennzoil. Chichi graduated with honors from Kennesaw State University, received her MBA at Georgia State University’s Robinson College of Business and is a certified Project Management Professional (PMP). She is a volunteer on the WIT Forums & Socials committee. Recommended literature for successful women and men in the workplace. Today is International Day of Charity. In celebration of #CharityDay and our 25th anniversary, make your donation today of $25, $50, $100 or any amount you choose! WIT JOBS BOARD – HOT JOB! Full-Stack Engineer, Very – Click here for the full description or to apply for this position.Very is a full-service firm for companies seeking to disrupt a market, whether they’re launching a new product or a new company. Very builds digital platforms with speed and agility for a diverse portfolio of companies – from venture-backed startups to corporate innovation teams. Based in Chattanooga with talent in 17 cities, Very brings deep experience in design and development to every project, every time. The deadline is September 8 – apply or nominate today! Click here to learn more & register for this event. Location: Double Tree by Hilton, 1075 Holcomb Bridge Road, Roswell, GA 30076Click here to learn more & register for this event. Click here to learn more & register for this event. Are you trying to solve big data problems? Don’t do it alone! Attend LexisNexis® Risk Solutions’ HPCC Systems® Summit Community Day. This year’s Summit is open to engineers, data scientists, technology professionals and students that want to gain new insights about HPCC Systems, the powerful platform that provides all the functionality to execute a data project. The Summit will include a Mastering Your Big Data with ECL workshop on Oct. 3, and on Oct. 4 segments will be dedicated to real world case studies academic insights beyond the classroom, a panel discussion of thought leaders, roadmap plans and much more. A 50% discount for both days is also available for students. Please contact students@hpccsystems.com from a valid university email address for more information. For more information regarding the agenda, student discounts, training workshop, the poster competition and other Summit Community Day details, visit: 2017 HPCC Systems® Community Day. THANK YOU TO OUR WIT PARTNERS!